In January 2010, Henderson, Nevada, opened a new senior facility and aquatic complex at Heritage Park, one of the oldest parts of the area that lacked facilities. The buildings replaced older facilities in other areas to increase the city’s ability to serve residents with more energy-efficient buildings. The 42,000 sq. ft. Heritage Park Aquatic Complex will serve patrons of all ages. It features two indoor pools: one competitive and one instructional/therapeutic. The competition pool has fourteen 25-yard lanes with four indoor springboard diving boards. It is designed to meet U. S. Swimming and Nevada Interscholastic Athletics Association standards, and will also be used by Clark County School District swim teams. The instructional/therapy pool features a depth of up to 4 feet and warmer temperatures, making it ideal for therapeutic purposes. It has four 25-yard lanes, a teaching shelf, and a ramp entry. 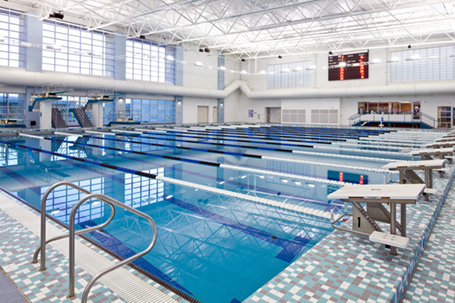 The Aquatic Complex includes ADA accessible pool lifts, aquatic classroom, full timing and scoring system, locker rooms, family locker room, and spectator seating for 600 people. The senior facility, designed to serve residents over age 50, includes a dance room, classrooms, fitness center, café, exercise room, game room, wellness center, two craft rooms, a demonstration kitchen with regular cooking classes, a mini-mart store, and outdoor plaza complete with bocce ball. The 30,000 sq. ft. building also houses a mini-library and a dining room where seniors can get an inexpensive lunch, serving as many as 350 seniors on some days. Both facilities are expected to be certified by the United States Green Building Council’s Leadership in Energy and Environmental Design (LEED) program.